Distress Oxide Inks – my first play. Today, I picked up the first 12 colours in the new Distress Oxide inks from my fabulous local art shop – Dandie Crafts. I’ve been looking forward to getting them since I saw them launched by Tim Holtz just prior to and during the Creativation 2017 craft show. 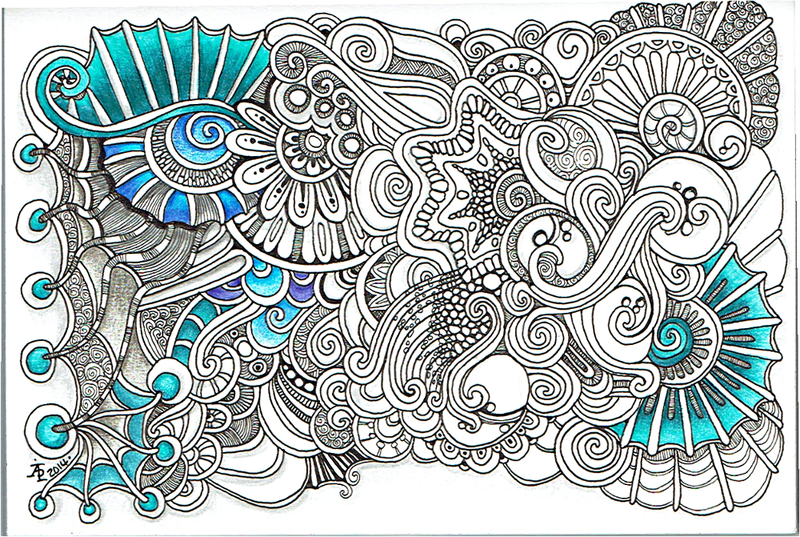 The above image is a typical ‘Angela-doodle’ drawn using Sakura Micron and UniBall UniPin pens on a background prepared using the new Distress Oxide inks. Before I let you know what I think of them, here’s a little bit about them. My first job on opening my ink pads was to test them out on different papers so I gained an idea of the colours they’d be, as well as how they react with water. To create these test swatches I stamped two ‘feathers’ with each colour on the paper/card. I then used an ink blending tool to smear some colour onto the paper. Next, I used a wet paintbrush to add water to the second feather before swiping the paintbrush across the smear and adding droplets of water to it. The first thing I noticed was how easy it was to stamp with the Distress Oxide inks. The original Distress Inks tend to stamp ‘blotchy’ – that’s the nature of them though! These, because of the pigment portion of the formulation, stamp with a more solid line. Not only that, the Distress Oxide inks are much more opaque than Distress Inks. Blending the Distress Oxide inks using a mini Smoothie blending sponge by Crafter’s Companion was an absolute dream! The inks went on so smoothly and, because they stay wetter for longer than Distress inks. Admittedly, I may not have picked the best paper for applying the Distress Oxide inks to, and there was some unevenness in the blend/smear, but it was much better than I’d manage to get with Distress Inks, unless I used a stencil brush to apply the Distress Inks very thinly and build the layers up. I don’t think I let the inks dry for long enough before adding water as I did note that some of the pigment moved when I brushed the feather with a wet brush, and the smear. That may be because I used a brush rather than using a spray bottle to mist water on them. It took longer for the Oxide effect to develop as I’d added more water than a misting would have, but the colours kind of soften on the white watercolour paper, and brighten on the Kraft and black papers. The opacity of the pigment ink is increased by the addition of water, and the colours really seem to glow. I then just had to go and create a background using the Distress Oxide inks. I used mini ink blending tools this time, and I used Strathmore Bristol paper with a vellum surface. The inks didn’t want to blend all that smoothly on this surface, however I wasn’t really too concerned as I just wanted a background to draw on. When I was happy with the colour blend, I did mist the surface with water to bring up the Oxide effect, as well as to have a few small water splatters on the surface. The Distress Oxide colours are much more ‘me’ than the original Distress Inks. They’re so creamy and rich in colour thanks to the pigment part. I also love the suede-like feel that results after a light misting with water. I’m really happy with these new inks and I look forward to experimenting with them more. I plan to use them like watercolour paints, I want to try using stencil brushes with them to blend the colours out, and no doubt I’ll find other ways to make colourful backgrounds for me to draw upon. Fineliner pen and coloured pencils on paper. A little less than A5 in size. A break from artwork being done for Michael O’Mara Books. Good news is that some people in the UK have received their copies of Color Me Calm ahead of the 27th Nov release date Amazon have on their website. Woohoo! This is most definitely a work in progress, and my first piece of raven art. 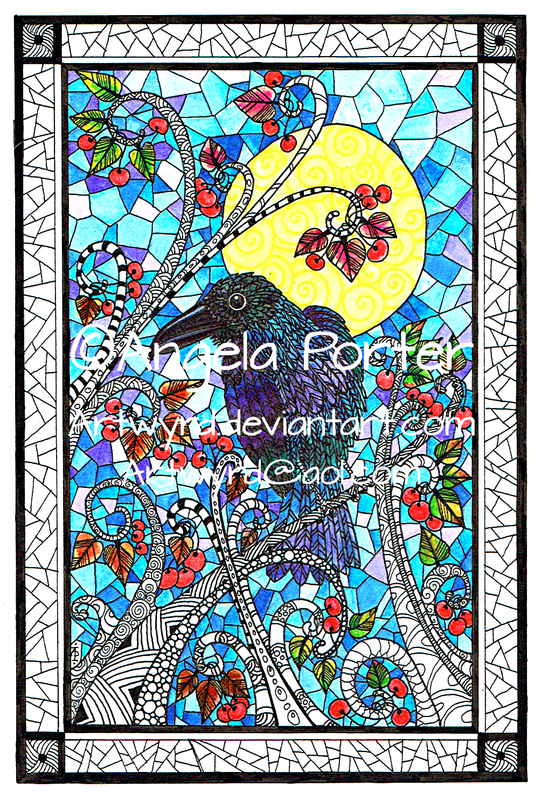 I have an affinity with and a love of ravens, as well as the rest of the corvids. My time with art has been very limited simply because being back at teaching is exhausting me. I do my best to find time to do art, but I often just fall asleep in the evenings because my brain is so tired from focusing and monitoring all day. The weekends seem to be vanishing in long periods of sleep too.